At Everest we can supply Customised Awnings for Restaurants and Gardens throughout the UAE. 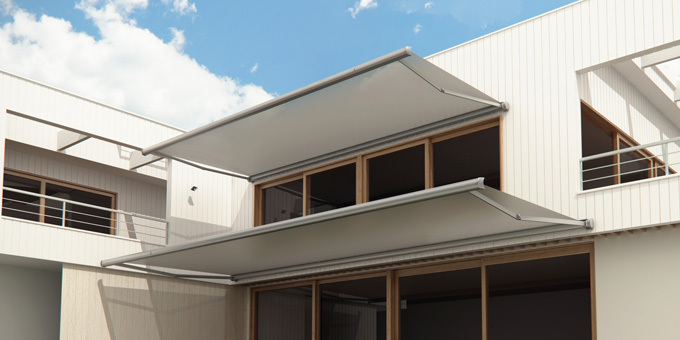 The awnings are available in a Range of Sizes as well as a choice of Manual and Automatic operation. We can even offer a wide selection of fabrics for the canopy. We can offer two types of retractable awnings. Monoblock the standard type and cassette which offers greater fabric protection when closed. The Awning is a lateral arm awning made with powder coated aluminium profiles. 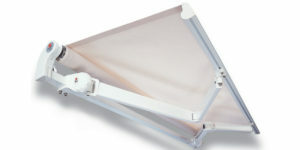 The awning is available in many different sizes. The frames are Strong and can with stand moderate wind. They should be closed under very windy conditions. The Awnings are available in a range of widths from 2.5 meters up to 6 meters. The projection or shade coverage also varies and they can shade from 2 meters up to 4 meters depending on the width. The most popular sizes are 3m x 2.5m, 4m x 2.5m, 5m x 3m. We are able to customise the canopy fabric based on the customer tastes. We can supply fabrics for the awning in Recesans and Sunbrella fabric. These are outdoor fabrics designed to withstand the Sun. You can view some of our fabric choices here. For a full range, contact our Factory. We are also able to offer the canopies with a flounce (flap) in either a straight style or curvy style. There are two options for opening and closing the awning. Manual operation or Motor Operation. Manual operation requires using a removable winder to open and close the canopy. 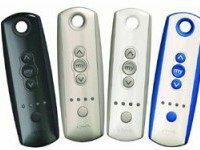 The motor operation features a wireless controller to easily open and close the awning. The retractable Awning is available to view at our Factory in Al Quoz, Dubai.